It is popularly thought that the Druids were Celts. Others have speculated that they were a caste of priests who migrated to Britain from India or Chaldea. In order to discover the truth of the matter, we have to go back a very long way indeed. Even modern scholars such as Sir Barry Cunliffe in his book Druids: a very Short Introduction (Oxford University Press, 2010), admits that although the earliest written references we have go back some 2,400 years, the origin of these ancient philosophers and teachers remains a mystery. Not that we recommend this book, which at just over 150 pages, tells the reader nothing worthwhile about the Druids. However, we do agree with the eminent Professor of archaeology that the so-called 'Celtic' languages originated on the Atlantic coasts of Europe and spread eastwards, a view that is not shared by the majority of the good Professor's colleagues. Nonetheless, his theory is correct as we shall see later. Another widely-held belief is that the Druids performed human sacrifices. Indeed, Wikipedia, that fountainhead of 'unbiased' and 'accurate' facts, tells us this in no uncertain terms: "Greek and Roman writers frequently made reference to the druids as practitioners of human sacrifice." A National Geographic documentary broadcast on US television in 2009, affirmed this popular notion and drew on considerable historical and archaeological evidence to support it. We shall return to this contentious point later too. Now, although there were Druids amongst the Celts, this does not prove that all Celts were Druids, and this is a trap into which many writers have fallen. The ancient authors were unanimous in saying that the Celts came from the East. It may be that they were right, but on the other hand it may be that those 'Celts' were fugitives from Atlantis who spread all over the then known world, as we suggested in our article about Stonehenge. Let us see what these old writers say about the Celts. They at least were nearer to the times these people or peoples lived, and so ought to know more about them than modern 'experts' who cling to the belief that 'civilisation' began with the Greeks and that there is nothing the ancients knew that they do not know better. Caesar tells us that the Gauls were always called Celtae by the Romans and by the Greeks Celtae or Celt. Whenever the first century Greek poet Parthenius speaks of the Gauls, in the story of Hercules and Celtina, he makes use of the term Celtina, or Celtum. And in the same story Diodorus Siculus calls the Gauls, Celts or Celtae of Parthenius Galates, the people of the Galatians. The second century Greek scholar and poet, Callimachus, in his Hymn to Delos, (which was the birthplace of the God Apollo), indiscriminately uses the words Galates, Galatia and Celtae for one another. Virgil calls the inhabitants of Cisalpine Gaul Galatae. This was the northern parts of Italy inhabited by Celts during the 4th and 3rd centuries B.C., and later conquered by the Romans in the 2nd century B.C. Later still it was merged into the Roman Republic. The Abbé Paul Pezron (1639-1706) writing about the Celtae says: "At least a part of them were called Cimbrians and Cimmerians, before they bore the names of Galatae and Gauls." Herodotus tells us that the Celtae are the most remote inhabitants to the West of Europe. In other words closer to ancient Atlantis. At the mouth of the river Elbe, on Herodotus' map, is place called Amber, or Umber (now Hamburg). This is nearly opposite to the north-eastern shore of England, where we find the river Umber, Northumberland, and C‒umberland, showing once again, the close links between these various descendents of the Atlantean immigrants. The Celts have even been traced back by some imaginative historians to Gomer, the eldest son of Japheth, one of the three sons of Noah, whose name was perpetuated in the Gomerians, afterwards called in the west of Europe the Cimbri and Cimmerians. It is said that these people, by abbreviation called Cimbri, were the same race as the tribe called the Sennones who under their leader, Brennus, pillaged Delphi, in Greece during the 4th century B.C., and are unanimously called Gauls. The 1st century B.C. philosopher, Posidonius states definitely that the Greeks gave the Cimbrians the name of Cimbri. The ancient Britons too were called Cumeri and Kimbri. We have not given you all these different theories simply to pad out this article or waste your time. They prove that there has been much guesswork on the part of all these ancient writers, who could not account for the mysterious Cimri at all, but sought in vain to discover their origin in Europe and Asia. This was (and remains) a hopeless quest, for they originated in Atlantis, just as the Druids did. Caesar tells us in his Commentaries on the Gallic War that Druidism originated in Britain, which was its greatest stronghold. "They know much about the stars and celestial motions, and about the size of the earth and universe, and about the essential nature of things, and about the powers and authority of the immortal gods; and these things they teach to their pupils." All this is true, but as we shall see, Druidism did not originate in Britain, but in Atlantis as we said earlier. The great similarity that exists between all the alphabets of the various nations, shows a definite link, and if we compare, for instance, the letters of the Samaritan, Hebrew, Chaldean and Greek alphabets, placed in their true ancient positions, and then compare these with, for instance, the Irish Bobiloth alphabet, and the ancient Etruscan alphabets, and so gradually approach to the English letters we have today via all these other systems, the link appears very clearly, and it points to one common source—Atlantis! You may study this with profit in the books reviewed in our article about Atlantis. According to Caesar the Gauls used to go to Britain to improve themselves in the discipline of the Druids, and this may mean that France and Britain used the same language in those distant times. The oldest inhabitants of Spain, the Turdetani, were Celts, like the Druids in England, and the first century Greek historian, Strabo, says that they possessed laws written in verse a thousand years before Strabo's time. According to the Roman senator and historian Tacitus, who lived a hundred years after Strabo, wherever there were Druids, we find monuments with inscriptions in Greek letters, such as in Germany and Switzerland. Some writers have tried to prove that Caesar did not say in so many words that it was the Druids in Britain who used writing, but that matters little, for the Druids in Gaul did use it, and if in Gaul, then why not in Britain? As it was Caesar's friend and ally Divitiacus, who was monarch over both Gaul and Britain, as well being chief Druid, who provided Caesar with much of the information for his histories, there is no reason to doubt that both countries used the same system of writing in the past. We learn from the quarrel between Celsus and Origen that the Druids were well known to the Roman Philosophers, who regarded the Druids as examples of wisdom and models for imitation on account of some sort of preeminent merit they possessed. 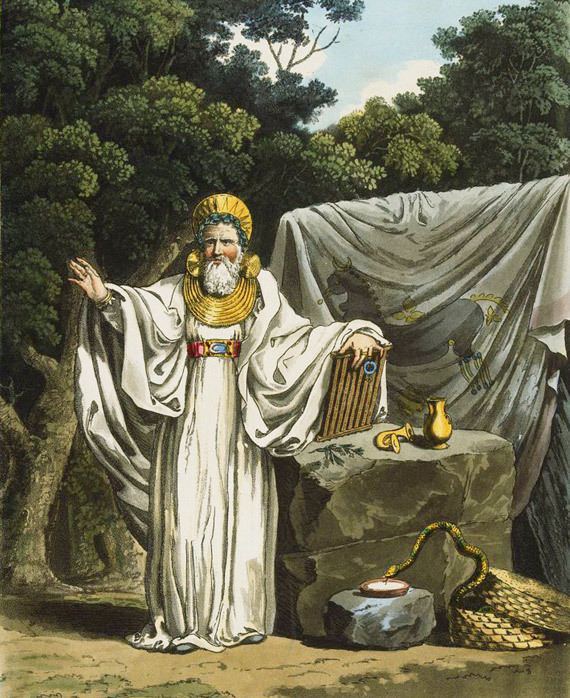 Divitiacus travelled to Rome where he became a guest of Cicero, who spoke highly of the Druid's knowledge of divination, astronomy and natural philosophy. As the Mysteries of the Druids were based upon the ancient wisdom of Atlantis it is clear that the particular merit the Romans admired was the knowledge of the occult sciences possessed by the Druids. However, the real secrets of the Druids were preserved by memory only and passed on from one priest to another by word of mouth, though probably some records were made in an allegorical and symbolical manner, the meaning of which could be understood only by the Initiates. The same applies of course to the ancient Egyptian writings as John Temple discusses in several of his articles on the Search for Truth. This is the principal reason neither ancient nor modern scholars—not having been initiated—can tell us anything worthwhile about the Druids. The affinity between the Greek, Roman and Celtic languages has been taken as proof that there was a regular stream of emigration flowing from East to West. But we suggest exactly the opposite: that this stream ran from West (Atlantis) to the East, at the time when that Continent was gradually breaking up, for as we pointed out in our article on Atlantis, the destruction occupied a long period of time. Several remnants remained until comparatively recently, and the population of these remnants fled to Europe, Africa, America and India. And this is the reason for the connecting links between the various languages we mentioned above, and between the secret doctrines of the Druids, the Egyptians, and the Aryans of India. All came from Atlantis, sowing the seeds of Atlantean culture and learning everywhere, though gradually these teachings became modified in diverse ways and adapted themselves to the countries in which they took root. But there a common likeness in all the religions, no matter where we find them. And this applies especially to the esoteric teachings of all these various religions. Consequently, we see no reason why the Druids may not be the direct descendants of the Atlantean emigrants who spread all over Europe, mingling with, and becoming gradually merged with the indigenous inhabitants. When this happened no one can say and we are not going to speculate either, except to say that it was well before so-called 'recorded' history. In this connection it is noteworthy that the remnants of the Celtic language are still to be found scattered in the French and British languages, as well as in Basque, Welsh, ancient Cornish, Irish and Manx. The speakers of these languages all live and lived near the borders of the Atlantic Ocean, pointing the way once again to Atlantis. We have seen that there has been (and remains) much speculation about the origin of the Druids. Some have said that they were Iberians, others Gauls, and still others Hebrews. Caesar said "that the maritime parts of Britain were chiefly inhabited by people from Gaul and the Belgae, who called their new towns and habitations by the names of those places that they had left." There is no reason to doubt this, but it does not prove who the Druids were in the first place. We must mention all these things in order to put you on your guard when reading various books about the supposed origins of the Druids. The Scots say they conquered Ireland; the Irish that they conquered Scotland, and the Welsh that they conquered both! This is all very amusing, but there is no proof of any of these statements. And so it is the world over, speculations galore, but very few facts and even less truth. Clad in their long dress, who could equal them? Their skill is celebrated; they were the dread of Europe." But why Asia? Gafis, as some writers have pointed out, may have meant Cadiz in Spain which was anciently called 'Gades'. In any event, here again we find a seafaring people who arrive in the British Isles, and no one is certain where they come from. Atlantis would solve all these difficulties, for as we mentioned in our article about the lost continent, some portions of Atlantis still existed almost up to historical times. So we have now answered our first question: what is the origin of the Druids? They came from Atlantis and spread all over Europe and possibly even further afield. If the Druids came from Atlantis, which we do not doubt in the least, then the Druid order and teachings must have existed there too. So what did these teachings consist of? Before we discuss them it is important to make clear that although the Druids were the moral instructors of the people, they carefully preserved their learning from vulgar gaze, so that the uncouth or unscrupulous should not have access to this secret knowledge. This is the same rule that applies to all genuine occult orders. Moreover, as we said earlier, the Druids taught by word of mouth, so that their pupils had to learn every occult law and principle by heart. In their academies all precepts were delivered as catechisms or in verse, and we quoted a few of the questions the pupils of the Druids were expected to know the answers to in our article on Initiates and Initiation. So those of our readers who have studied the occult sciences under a genuine teacher of the Mysteries, or are doing so and complain what hard work it all it is, should blush with shame in the face of their Druid predecessors, who had to learn all these Mysteries by heart with no books, diagrams or 'cliff notes' to help them! That never felt the woodman's stroke. The plate of judgement clasp'd his breast. Return'd the fleet-wing'd sons of sound." The Druids thought it improper to the sublimity and immensity of the Divine Essence to confine their adoration and worship within buildings, and so conducted all their rites in the open, in woods, or within stone circles, as we discussed in our article about the great temple of Stonehenge. All such places of worship were surrounded by oaks, for the oak was to them a holy tree indeed, and these oaks gave the Druids their name, as many writers have suggested, the word being derived from the Greek word 'drus'—an oak tree. Perhaps it was the other way round, and the oak was named in Greece after the Druids, whose sacred symbol it was, but this does not really matter. As we have seen, the Druids ordered the religion and the ceremonies of the people, whose directors they were. They regulated the decisions of princes in matters of public policy, while they enjoyed various immunities and privileges. In Ireland, as well as everywhere else, they had the management of sacrifices, and here we touch upon an interesting point we mentioned in our introduction. What were these sacrifices? There are many tales about the Druids offering bloody sacrifices upon their altars, where human beings and animals were slain in honour of the 'gods'. Caesar claimed that Druids burned people to death inside "wickerwork figures of vast size", a gruesome ritual graphically depicted in the classic 1970's British horror film, The Wicker Man, which some of you may have seen. Tacitus claimed the altars of Druids in Anglesey were "drenched with the blood of prisoners" while other Roman authors told how they sacrificed white bulls in their sacred groves. Now it is probable, even certain, that there were fanatics who called themselves Druids who committed such dreadful acts. But to believe that the real Druids as a whole would use such diabolical practices would be entirely wrong. We find confirmation of this in the account given by the seer, Geoffrey Hodson, of a Druid rite that he witnessed clairvoyantly at a stone circle in Keswick, in the English Lake District. We shared part of this description with you in the commentary to our occult studies course article on Magic. What we did not quote then due to lack of space, but do so below, is what Hodson saw many millennia after the real Druids were no more, and their sacraments were perverted by later generations of devilish imposters. "Other scenes, far less holy and beautiful, have been enacted here, other priests of dark and fierce aspect have stood within the inner ring. One fierce Viking-like figure, wearing a helmet with two horns upreared on each side of his brow, stands with bloody knife beside the altar stone. Dread now has taken the place of reverential awe in the hearts and minds of the congregation, and hatred has taken the place of love. No longer does blessing from on high pour down upon them. Now it is a power from below, which rises as if from the centre of the earth in answer to the invoking call; ugly as sin are the elemental shapes which hover round the ceremonial of blood. Women now live with men down at the ancient monastery, and the pure discipline and self-restraint of other days are gone. "In later times this ring, once the centre of such lofty ministrations, was foully desecrated by the followers of the ' Lords of the Dark Face,' and still clearly to be felt here is the scene of carnage which followed on the uprising of the surrounding tribes against the iniquities by which they had been overawed for many generations. The priests and priestesses were slain, victims were set free, and in their fury the mob demolished the dwellings at the foot of the hill and overthrew many of the temple stones." Here is proof that what Caesar, Tacitus and others reported, was not the sublime Wisdom and holy worship of the primitive Druids which Cicero so admired in the person of Divitiacus, but the bloody rites and superstitions of their savage and degenerate imitators. Moreover, we must not lose sight of the fact that the Druids who remained in Britain and Gaul during the first centuries of the Christian era were the implacable enemies of Rome and opposed the invaders at every opportunity. This is quite sufficient to explain the Roman calumnies against the Druids. Yet there is comfort in what Hodson tells us in the final paragraph of his account which you can read in full in our afterword. "Down through the thousands of years which follow, it is the first, the nobler, the uplifting influence which lasts and which is the most strongly impressed upon the place, showing something of the grandeur of the religion of ancient days." This is further confirmation that the bloody rites which Caesar rightly decried probably took place many thousands of years after the real Druids had departed to a better life. This also gives us some idea of just how long ago the first Druids arrived in these islands. No; the real Druids did not indulge in blood sacrifices, but were men and women distinguished for their wisdom, compassion and understanding, and thus vastly superior to the superstitious and ignorant priests of the heathens. So if the real Druids did not slay innocent victims on their altars, what did they sacrifice? Their offerings probably consisted of flowers and fruits, such as was also the custom in ancient Egypt when the rites were pure. We have now seen that the Druids taught the occult sciences, the same as their counterparts did in ancient Egypt, in India and other places. They also concerned themselves with the science of the stars and planets of which modern astrology is a very pale and incomplete copy. As we explained in our article on this much misunderstood art, a real astrologer needs certain gifts which the average practitioner lacks. To arrive at a true interpretation one needs inspiration of the highest sort; the kind of inspiration the famous Sybils of antiquity gave evidence of in rare instances. We have no doubt that amongst the Druids such Sybils were to be found; but they were always under the direct supervision of the initiated priests, and their trances were not for all and sundry, but for the purpose of guiding important personages if this was considered necessary. This gave the Druids added power, but this power was used for good when the priesthood consisted of men of high moral and intellectual worth. This, however, cannot have been the case at all times, for humanity is frail and there are very few truly wise men at any time who can be entrusted with such matters and not turn them to selfish use. As different writers have correctly stated, the Druids believed in one God, in the immortality of the soul, and that men were rewarded after death according to their actions during mortal life. That 'reward' is either reincarnation or liberation from earthly life. We can find considerable information in old Irish and English books relating to the rites and magical practises of the ancient Druids, but whether this information is always correct is another matter. For unless a person is fully acquainted with the occult sciences, it is hopeless to expect to understand the work of the Druids. For this reason we find much speculation, a great deal of superstition, and still more misinformation about what the Druids actually knew and did. Some of the favourite maxims of the real Druids were to obey God's Laws, to attempt to benefit Man, and bear well all Life's happenings. Any person not living and acting in accordance with these precepts was not worthy of partaking of the Druidic Mysteries. That their influence was enormous can be seen from the fact that even kings were not permitted to act without consulting the Druids, nor hold any deliberative meeting in which the Druids did not participate. There was always a Druid near the king, to pray for him and to advise on all matters. Every noble was likewise attended by his own personal Druid. At the same time the ordinary people feared the Druids exceedingly on account of their incantations and magic practises. These incantations were probably no more than prayers to the Deity and the intoning of certain words of power in a mysterious manner. We have mentioned words of power in several of our articles without explaining what they really are. Let us now tell you. We can make any spoken or chanted sound a 'word of power', according to the meaning we attach to the word and the intention behind it. So much drivel has been written about these words that it is time you knew the truth, so you will not be misled in future by any mystery-monger who pretends to be the possessor of certain secret words that have tremendous magical properties! The Druids knew many scientific facts, such as the use of the compass, by means of the loadstone. They must also have known the telescope, for Diodorus Siculus tells us that the Druids brought the sun and moon near to them, and they also knew that the Milky Way consisted of a mass of stars. Some may object that the art of making glass was not known in the times of the Druids, much less the making of glass lenses. But we must remember that the ancient Egyptians knew the art of making glass, and there are many examples to be seen in museums and private collections of delightful glass vessels of all sorts, so if they knew the secret, there is no reason to doubt that the Druids knew it too, for both came to Europe and Africa from the same continent—Atlantis. Another secret of the Druids was the making of pulvis fulminans, or explosive powder. They also knew the secret of artificial lightning, in other words, of electricity. Sir William Temple, in his essay On Ancient and Modern Learning, tells us that Druid priests "kindled a storm of thunder and lightning which, in three attempts made to rob their temple, drove back the invaders, with loss and terror." There are many similar accounts of such happenings in the books of the ancient authors. Interestingly, the Gallic word for lightning is De'lan or De'lanach, which means the flash or flame from God; and Drui'lan or Drui'lanach, the flame or flash of the Druids. The youths whom the Druids educated were taken to the most secluded situations, to caves, or woods, or rocky cairns, and their education took twenty years to complete. The same system of education was followed in ancient Egypt with very minor differences. It was the old and sound idea of a real education in holy matters, and twenty years is not too long a period for the purpose. As we said earlier, the Druids believed firmly in reincarnation, and we need not tell you that they were not alone in this belief. The 1st century A.D. Roman author Valerius Maximus tells us that it was no unusual thing for a Gaul to lend money to be repaid in another life, as is the belief today amongst several Eastern peoples. Now there is more in this 'superstition' than meets the eye, for you may be sure that if you owe anything to anyone, no matter what, you will have to repay it at some time or another in some way. If it were not so, then there would be no justice of any sort. The worldly wise may laugh at this but let them not be too sure! The moral doctrines of the Druids imparted to the common people were short and simple: to worship the gods, to do no evil, and to be valiant in battle. This is a most comprehensive code, for it includes our whole duty to God, our whole duty to man, and our whole duty to our country. This seems to include all that matters, though one could go on extending these rules, without improving them. The Druids were well versed in herbalism, as it is called today. Vervain was one of their favourites, and they used this in casting lots and foretelling future events; they also used it to anoint people to prevent fevers, but it was to be gathered with certain ceremonies and at certain seasons of the year. They deified the mistletoe, and were not to approach it except in the most devout and reverential manner. When the end of the year approached, they marched with great solemnity to gather the mistletoe of the oak. But this mistletoe had to be that which grew on an oak, and no rites were performed without oak leaves. The Druids held that whatever grew on the oak was sent from heaven, and the oak was the tree especially chosen by the Deity. Mistletoe was gathered on the sixth day of the moon, for this was the day with them on which all months and years commenced. Mistletoe was called by them "All heal." In modern herbalism mistletoe is in action nervine, antispasmodic, tonic, narcotic, and is used with benefit in hysteria, epilepsy and other nervous diseases. Recent studies on animals have shown a reduction in blood pressure with mistletoe extract. But we must issue a serious warning here for those tempted to experiment; never consume raw mistletoe: It can cause seizures and even death. Always consult a qualified doctor. The strenuous defence of their country's liberty was of paramount importance to the Druids, and after every defeat they constantly excited their countrymen to further insurrections. This was the reason why the Romans tried by every means in their power to destroy the Druids and calumniate their beliefs and practises as we discussed earlier. The Druids were so determined in their defence of Britain that neither the Romans, Saxons, Danes or Normans could fully conquer them, but in the end they had to retreat before overwhelming numbers and established themselves in the mountains of Scotland, Wales and Ireland, where they successfully defended themselves against the legions of the Roman and Saxon barbarians. It was not until the insidious arts of the Christian priests had destroyed their influence and unnerved the arms of their gallant followers that they could be tamed at all. For more than a thousand years they maintained their country's independence in the mountains of Scotland and Wales, whence they constantly made incursions upon their enemies. But though the Druids are long gone and their places of worship lie despoiled and desolate, we can truly say that their warlike spirit survives in Britain, as has been shown over and over again whenever that spirit needed arousing in defence of these islands. In 2019, we published the first of a new series of articles about the Atlantean fugitives and how they fared in the various places they fled to around the globe. Readers who are interested in exploring the rich legacy of Atlantis further, will be sure to enjoy this new three-part investigation. Meanwhile, we hope that this investigation has given you much food for thought and corrected not a few misconceptions about the Druids who once taught the Sublime Mysteries in these islands and dispensed justice and mercy to all the peoples under their care. © Copyright occult-mysteries.org. Article published 21 October 2017. Updated 20 January 2019. In this afterword we reproduce the full account of Geoffrey Hodson's clairvoyant observations of a Druid temple in the English Lake District, related by him in Fairies at Work and at Play. We previously published an abridged version of this account in the commentary to our occult studies course article on Magic. Little is now left of this stone circle, as you can see from the photograph above. 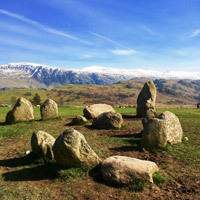 It is located at Castlerigg halfway between Ullswater and Derwent Water, close to the town of Keswick, so if you wish to visit it to see whether you can sense the ancient events Hodson recalled, you know where to find it. Unlike Stonehenge and other Druid temples, it is mercifully free of wire fences, souvenir shops and costs nothing to see and explore. While attempting to study the fairy inhabitants of the English Lake district, a visit was paid to the Druid's Circle, situated near Keswick. The incidents described below appeared to be so vividly impressed upon the place that I decided to try to describe those which seemed to be within the reach of my vision, instead of studying the normal fairy life of the district. This is a complete Druid circle, consisting of single stones, varying in height from one foot to six feet, and surrounded on every side, except on the east, by mountains. Standing out vividly, against the background of many strange scenes which pass before the inner eye, is the impression made upon the place by the powerful personality of one man. A mighty figure, priest, teacher and healer of his people, he stands out, like one of those rugged heroes of antiquity one reads of in the stories of ancient days. He is above the average in stature, dignified and impressive, with long dark hair and beard, which, later, became pure white; he is robed in a single white garment, reaching to his feet, not unlike the surplice of to-day. I see him standing here, where we are now seated, within the inner circle of rocks; behind him is a group of priests, robed as he is. Draped over tall rocks, which have now disappeared, is a banner of pure white, on which is worked a golden serpent. A large concourse of people stands at some distance outside the outer circle, as if waiting for a signal. The high priest, who is evidently a master magician, raises both hands to the heavens above him, lifts up his eyes and utters a loud call. Hovering in the air are a number of Devas of various grades, and, at his call, six or seven of the largest of them form a circle over his head some 80 or 100 feet in the air; their hands meet in the centre bearing fire, which is materialised so as to be visible to physical sight. A noticeable feature about these larger Devas is that each one is wearing a crown, consisting of a narrow fillet of gold, encircling the head, in which are set dazzlingly bright jewels; at various positions round the head this fillet widens to upward points, a group of larger points resting over the forehead. The fire descends upon the altar stone in front of the high priest, and burns brightly without visible sustenance. The other priests then form into two ranks and march forward to the altar stone, chanting a low and rather guttural hymn. On the descent of the fire the people form themselves into columns facing the three entrances at the north, south and west, and then march forward till they almost meet in the centre of the circle, leaving a fairly large square unoccupied. The people and the priests, with the exception of the high priest, then make obeisance to the fire; they stretch their arms forward and bow their heads, remaining in this position while the high priest utters a long prayer. A very powerful magnetic insulation existed, and still exists to some extent, round the circle, giving quite as much seclusion, from the occult point of view, as would a complete and solid temple. As the people stand with their heads bowed the Devas descend quite close to them and a force, not unlike lightning in appearance, plays along their backs in the form of a huge cross. Lesser nature-spirits occupy the spaces in between the arms of this cross, some of them, as workers, holding the force along the lines of the cross, others apparently quite as much part of the congregation as the human beings. The priest evidently is conscious of the existence of some mighty spiritual entity, to whom he is praying and from whom the response apparently comes. This may be a nirmanakaya (occult Adept) or a lofty Deva, and the reservoir from which the power flows, and over which the being apparently has charge, appears to be situated high up in the heavens vertically over the temple. The effect of the prayer is remarkable; the very heavens appear to open, and an enormous downrush of force pours into the central square formed by the people on three sides and the altar stones on the fourth. The people again stand erect, and the Devas become intensely active, their chief concern being to see that the maximum of this force reaches the people, with a minimum of overflow and waste. The down-flow continues for some time, forming a veritable pillar of living power, whose appearance I am at a loss to describe, as any words of mine would inevitably fail. The nearest description I can give is to liken it to liquid, fiery mother-of-pearl, opalescent and tinged with an inner colouring of rose. It penetrates downwards far into the ground and reaches upwards out of sight into the heavens. The high priest plainly sees it, as do some of the priests; the people feel its presence, but few appear to see anything. All adopt a highly reverent attitude of mind and body, and realise the sacred nature of the occasion. At a given signal from the high priest a number of sick and old people are carried into the spaces between the arms of the cross formed by the congregation; they are then led or carried into the square, where those who cannot stand are laid upon the grass, just outside the pillar of force. The weather is cold, and some of the sick and aged appear to have been suffering from this. The position they now occupy, however, greatly improves their condition. I see one man, of old and decrepit appearance, who was laid at the northern side of the square, raising himself on his right elbow, and extending his left hand towards the pillar, like one warming himself at a fire. A glow of heat and magnetic energy passes through his frame, his eyes light up, and after a few moments he rises to his knees, where he remains, still a tottering figure, but marvellously improved in both mind and body. He holds out the palms of his hands like a cup, into which one of the priests pours a little pale yellow liquid, which the old man drinks. Many others, men, women and children, receive such liquid. In cases of wounds the high priest heals them instantaneously by merely passing his hands over them. A tremendous power is flowing through him, his body appearing to be illuminated throughout with golden light; he evidently knows much of the inner powers of man, and his touch has a magical effect upon his patients. This portion of the ceremony lasts probably from twenty minutes to half an hour, after which the whole attention is focused on the high priest, who, standing on a flat stone, delivers an exhortation. I cannot grasp a word of his utterance, but the main idea appears to be an appeal for the humanities and an endeavour to assist the people to realise their unity and interdependence. There are some rough, wild spirits amongst them who, although tamed for the time being by his power and that of the ceremony, are by no means so gentle and submissive in the fastnesses from which they have come. Having concluded his discourse, he led the people in thanksgiving, all together making three obeisances like the one performed at the beginning. At the third, while the gathering remained with heads bowed, the high priest again looked up to Heaven and spoke; the downflow of power ceased quite suddenly, and the pillar disappeared. The people then turned about and, chanting with the priest, walked out of the circle by the entrances which had admitted them. They broke formation outside the circle and waited. The high priest then turned towards the serpent symbol and the priests who were facing him. He spoke to them and blessed them, swiftly making with his hand certain symbols in the air, which seemed to be of a circular or spiral nature, and which remained visible as they passed from his hand into the auras of the priests. He then extended his arms before him, partly open, as if to embrace the company of priests. They bowed their heads and a stream of power flowed from him to them and to the banner; this was maintained for an appreciable time, maybe ten seconds, during which the priests were lifted into a state of great exaltation; the banner was then rolled up, and the priests passed out of the inner circle, talking to those whom they knew, and, in some cases, moving off with them, as they gradually dispersed. The high priest, however, and some of the others, together with a few of the congregation who were apparently attached to his person, proceeded down the slope to the east, where there was a group of stone dwellings at the foot of the hill. Each person appeared to have a small cell of his own, in which was a rough bed of earth and peat. The windows were openings in the wall and the whole place decidedly primitive, though not uncomfortable. The high priest, immediately on entering his compartment, seated himself on a bench, and became entranced; he seemed to remain in this state for a long time, doubtless his consciousness was freed from the body. The country all around was much wilder and bleaker than it is at present, and there was a good deal of warfare continually going on in different parts, as a result of marauding excursions by surrounding tribes. It would seem that some of the wounds healed during the ceremony had been received in these encounters. Evidently there were many ceremonies at which the priests alone were present. I see them, standing in the inner circle, saluting the rising sun. On another occasion a ceremony is being performed at night, beneath the starlit sky, when the attention of the company is directed to a brilliant star, low on the north-western horizon. I notice, also, some system of signalling in operation, for there are people on the summits of Skiddaw and Blencathra and Helvellyn whose attention is directed to the circle from which their signals are plainly visible. Apparently beacon fires were used. A system of contemplative discipline was evidently employed by the priests, some of whom possessed the power of self-entrancement. This temple appears to be in magnetic contact with a centre of the same religion lying to the south west, and a great way off. At a later period, when only the memory of this priest remained, he was worshipped almost as a deity by succeeding generations, who regarded him as the master and founder of their temple and its worship. A mighty white magician apparently he was, as well as a teacher and lover of his people. I see him, at a date much later than the ceremony, a very old, but still perfectly upright, white-headed figure, supported by two priests, making slow progress from his dwelling up to the temple, where a much bigger concourse of people is gathered together. They greet him with a great shout, waving their arms with sticks and weapons in the air. Their shouting dies down to a murmur as he approaches the altar, and in a low voice he blesses them, stretching forth his right hand and waving it slowly over the crowd within the circle, beginning at the south and passing slowly round through the west to the north. All heads are bowed and the whole place becomes perfectly still, and when they look up again he has travelled some distance on his return to his dwelling-place; they watch him with hungry eyes, realising that they have seen him for the last time. Powerful emotion surges through them, many burst into tears and call after him. Among his priests are some young men of exceptional character to whom he has imparted much of his mystic nature lore, and into whose hands is given the task of carrying on the temple worship and ministration after the master has left them. How different is the scene before us now. The sun is setting in a golden glow, the quiet peace of a summer evening is broken only by the distant weird calling of the curlew and the cries of the numbers of young lambs who, with their mothers, are grazing in and about the ancient ring. Much of the old magnetic influence remains and can be felt; so strongly impressed on the place are the ancient ceremonies that they rise up continually before the inner eye. Other scenes, far less holy and beautiful, have been enacted here, other priests of dark and fierce aspect have stood within the inner ring. One fierce Viking-like figure, wearing a helmet with two horns upreared on each side of his brow, stands with bloody knife beside the altar stone. Dread now has taken the place of reverential awe in the hearts and minds of the congregation, and hatred has taken the place of love. No longer does blessing from on high pour down upon them. Now it is a power from below, which rises as if from the centre of the earth in answer to the invoking call; ugly as sin are the elemental shapes which hover round the ceremonial of blood. Women now live with men down at the ancient monastery, and the pure discipline and self-restraint of other, earlier days are gone. In later times this ring, once the centre of such lofty ministrations, was foully desecrated by the followers of the 'Lords of the Dark Face', and still clearly to be felt here is the scene of carnage which followed on the uprising of the surrounding tribes against the iniquities by which they had been overawed for many generations. The priests and priestesses were slain, their victims were set free, and in their fury the mob demolished the dwellings at the foot of the hill and overthrew many of the temple stones. Down through the thousands of years which follow, it is the first, the nobler, the uplifting influence which lasts and which is the most strongly impressed upon the place, showing something of the grandeur of the religion of ancient days in Britain. Here ends Geoffrey Hodson's moving and instructive account of what he saw in the long ago in Britain which confirms all the facts we have presented to you in this article. It is interesting that he mentions that the stone circle he visited appeared to be in magnetic contact with a centre of the same religion lying to the south west, and a great way off. Could this have been the great solar temple of Stonehenge we discussed in a previous article? Very probably. We cannot vouch for the accuracy or completeness of all the books listed below. Those digitised by the Sacred Text Archive are generally of a very high quality. Print-on-demand editions sold by Amazon and other sellers, especially Kindle versions, may be incomplete and contain errors and omissions. The Mythology and Rites of the British Druids. Taliesin: or The Bards and Druids of Britain. D. W. Nash, London, 1858. The Veil of Isis, or, Mysteries of the Druids. W. Winwood Reade, London, 1861. Barddas; or a collection of original documents illustrative of the Theology, Wisdom and Usages of the Bardo-Druidic System of the Isle of Britain. Rev. J. Williams Ab Ithel. M.A., The Welsh Mss. Society, London, 1862.
Who built Britain's enigmatic prehistoric monument and why? We investigate the theories and the facts. Evidence for an ancient Egyptian colony in the British Isles.